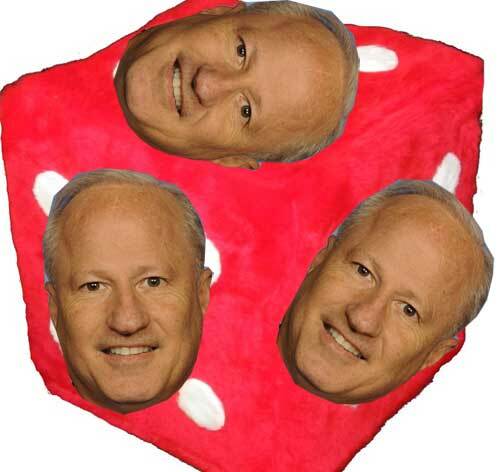 Go ahead and roll the dice — “Major Confusion” Coffman has every side covered. [Coffman] voted against the amendment that seeks to end the Deferred Action program and the final bill, which included the amendment. Immigration policy is confusing enough without Coffman's help, so stay with us here – this is about to get silly. Congressman Coffman is a former U.S. Marine. If you’ve spent any time around Colorado politics, you are almost certainly aware of this; Coffman never misses an opportunity to mention his military career and call upon related clichés such as “boots on the ground.” We do not have a negative word to say about Rep. Coffman’s service record. To borrow a phrase from Democrat Andrew Romanoff, Coffman’s General Election opponent in 2014, Rep. Coffman’s military career should be applauded and respected. His rank as a citizen lawmaker perhaps should be adjusted, however, to include the title “Major Confusion,” because that seems to be Coffman’s strategy when it comes to dealing with the issue of immigration. While nothing ever actually happens on immigration reform, “Major Confusion” always makes sure to take credit for specific immigration votes while at the same time making sure to so obfuscate his position that it seems like he’s always on your side on the issue (Coffman even issued a statement in Spanish today about how he totally supports DREAMers). This is a pretty clever political tactic, actually, even if it is completely meaningless. Coffman, a Republican, voted against a broad bill what seeks to undo the ability of illegal immigrants brought here as children to find a permanent home in the United States. Good for you, Congressman. It was an impressive and important move. The vote was nothing but a flagrant political slap to President Barack Obama as retribution for seeking administrative ways to solve immigration problems. But it passed, 236-191 because other Republicans don’t have the temerity and good sense Coffman showed. Today, the Republican-controlled House of Representatives passed a DHS funding bill, which included a collection of the harshest anti-immigrant amendments seen in years. The bill would not only overturn the sensible executive actions from last November, but also end the DACA program for DREAMers and maximize the deportation of all 11 million undocumented immigrants settled in America. If you disagree with everything you just read, we have one simple request: Explain Coffman’s position on immigration reform and what he actually proposes to do about the issue. …No luck, eh? That’s the idea. Remember, this is the same Mike Coffman who said throughout 2014 that he did not support a comprehensive immigration reform measure. Oddly enough, “Major Confusion” penned an Op-Ed that appeared in the Denver Post in July 2013 in which he declared, “The time for comprehensive immigration reform is now.” Less than a year later, “comprehensive” was systematically scrubbed from Coffman’s biographical materials as though it were a dirty word. There’s really no reason that “Major Confusion” can’t just lay out an immigration policy that is both consistent and logical. Coffman has made definitive calls in Congress before (such as demanding the resignation of Veterans Affairs Secretary Eric Shinseki in the wake of various VA scandals last summer), but that is clearly not the strategy when it comes to immigration reform. Make some votes. Say some things. Feign concern when nothing actually happens. If you can think of a better way to sum up Coffman’s immigration positions, we’d love to hear it. Everyone who voted for this guy because they thought he made any kind of sense about anything, please raise your hand . . . It's a shame that Romanoff never really articulated to the public any very compelling reasons to fire an incumbent who did a good job of sounding moderate enough at election time and had been around for quite a while with no particular scandals. Because Andrew supported education? Who doesn't say they support education. Because he said the federal government should have to balance the federal budget? Who needs to switch to a Dem if that's what you're looking for? I can't remember anything much else from Romanoff's blah unmemorable ad campaign.